Action from Bourne's (blue) 2-1 win over Irchester. 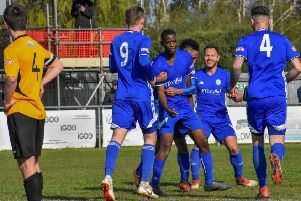 Unbeaten Spalding United hold the upper hand heading into tomorrow’s (August 29, 3pm) Evo Stik Division One South derby with Stamford AFC at the Sir Halley Stewart Field. The Tulips are fourth in the fledgling table following an excellent 3-1 win at Northwich Victoria yesterday (August 27), while the Daniels are 13th after they were held to a 1-1 home draw by Shaw Lane. Tom Batchelor rescued a point for Stamford with a 90th-minute equaliser. Action from Bourne's (red) 2-1 win over Irchester. Spalding were 2-0 up at half-time in Cheshire thanks to goals from Nathan Whitehead and Brad Wells - the latter now has six goals in his first four games for his new club. Johnny Lockie completed the scoring in the final minute after the home side had pulled a goal back. In the United Counties Premier Division, title-favourites Peterborough Sports continued on their merry way with a 5-0 home thumping of Cogenhoe United. Avelino Vieira bagged a hat-trick with Mark Jones and Josh Moreman also on target for a table-topping team who already boast a goal difference of plus 18 after winning their first four matches. Yaxley and Deeping Rangers also won big. Charlie Sanders bagged a hat-trick in the Cuckoos’ 5-0 win at Rothwell Corinthians, while Scott Coupland scored twice as Deeping won for the first time this season, 4-1 at Kirby Muxloe. Jack Friend scored a second-half hat-trick for Wisbech against Potton. Bourne are also off the mark in Division One after skipper Dan Smith and prolific striker Zak Munton scored in a come-from-behind 2-1 win over Irchester. But Blackstones are next to bottom without a win in six matches after a 1-1 draw at Rushden & Higham. Dan Evans scored the Stones’ goal from the penalty spot. Premier Division sides Holbeach United and Wisbech Town made comoftrable progress in the UCL Cup. Former Posh striker Jack Friend was a second-half hat-trick hero as Wisbech powered past Potton 4-1, while Jake Clitheroe scored twice for Holbeach in a 6-2 thrashing of Long Buckby. First-half goals from Dan Woods and Matthew Barber delivered a first win of the Eastern Counties Division One season for March. They won 2-1 at Debenham LC. The UCL Premier Division match at Oadby against Peterborough Northern Star was abandoned at half-time because of severe weather conditions with the score goalless. Division One South: Northwich Victoria 1, Spalding United 3 (Whitehead, Wells, Lockie), Stamford 1 (Batchelor), Shaw Lane 1. Premier Division: Kirby Muxloe 1, Deeping Rangers 4 (Coupland 2, Madigan, Mooney); Oadby Town 0 Peterborough Northern Star 0 (abandoned, 45 minutes. weather), Peterborough Sports 5 (Vieira 3, Jones, Moreman) Cogenhoe United 0; Rothwell Corinthians 0 Yaxley 5 (Sanders 3, Cotton, Nolan). League Cup: Holbeach United 6 (Clitheroe 2, Ford, Jackson, Tinkler, og), Long Buckby 2; Wisbech Town 4 (Friend 3, Frew), Potton United 1. Division One: Bourne Town 2 (Munton, Smith), Irchester United 1; Rushden and Higham United 1, Blackstones 1 (Evans). Division One: Debenham LC 1, March Town United 2 (Woods, Barber); Halstead Town 2, Wisbech St Mary 1.